This Ariel Little Mermaid Cake was made with fondant icing and it is beautiful. Blue Sheep Bake Shop in Metuchen, NJ made this cake...look at the detail they put on this kids birthday cake. There are two pictures of this amazing kids birthday cake on this page. Take a look! If you don't live near Metuchen, NJ you can make a cake like this. Are you familiar with fondant? It's a colorful and moldable icing that you can actually make yourself. You can roll it, fold it, drape it, bend it, cut it and sculpt with it. For more about this delicious icing go to our fondant page. Back to our beautiful Little Mermaid cake...of course you will also need some fun games, party supplies and a craft idea for your child's birthday. Get some fun ideas from our Ariel party ideas page or at Princess party ideas Ariel page. Little Mermaid Personalized Birthday Banner Standard 18" x 61"
You will also find some fun filled favor boxes with our Little Mermaid, Ariel, on them plus other fun ideas for a girls birthday party. 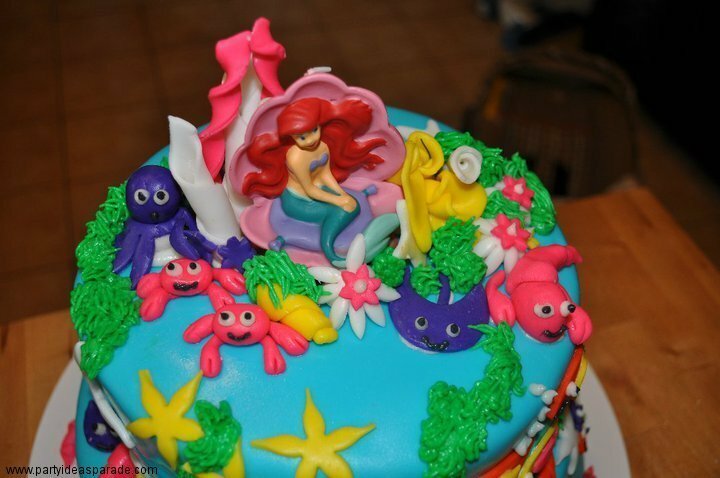 This picture of the Ariel Little Mermaid cake shows more detail of the top. Look at Princess Ariel and the characters of Disney's Little Mermaid. Imagine your little girls face lighting up when she sees this amazing cake! Check out the Blue Sheep Bake Shop in Metuchen, New Jersey or visit our Fun Cake Designs to see more fun fondant cake decorating ideas and cake pictures. Want to look at more cake pictures? Super Mario Bros or our Spiderman Cake.